In 2004 Margaret and I were fortunate to be invited on a pilgrimage with our teacher (of 30 years), the venerable Khenpo Karthar Rinpoche. We went, along with a group of Rinpoche's senior lamas and other students of Khenpo Rinpoche. When I say "lama," that means to me someone who has completed the traditional Tibetan 3-year, 3-month, 3-day closed retreat, during which they never lie down to sleep for that entire period. Instead they sleep sitting up in meditation position, and so on. There is a lot more to the 3-year retreat (and it is fascinating), but that would take a whole blog. Anyway, one of the lamas who accompanied Rinpoche on the 2004 pilgrimage to Tibet and China was Lama Wuufang. Now Lama Wuufang was always very quiet and somewhat serious in my experience. I had a natural respect for him just because of how he carried himself, but never really had a conversation with him. Little did I know that he would become my doctor! In the fall of 2012 I was diagnosed with a chronic lung problem (COPD) and became quite sick for some time. I recovered from that bout, but have had to be very careful of what I am breathing, and of my health in general. To make a longish-story short, Lama Wuufang became my doctor during this last spring of 2013, and quite by accident. My wife Margaret began working with Lama Wuufang after a visit to KTD Monastery, to which she goes more frequently than I do. He prescribed to her some Chinese medicine and she has been taking it. I was having some impacted sinus problems at the time, which became increasingly uncomfortable. Unable to travel, I spoke with Lama Wuufang on the phone and described my condition in detail. Among many other things (acupuncture, Chinese medicine, etc. ), Lama Wuufang is an Auricular therapist, meaning he diagnoses by examining the ear, and in this approach the ear corresponds to the whole body. He could not examine me over the phone, but he explained very clearly exactly what points on the ear I should massage and I did that. By the next morning, my sinuses were open again. Later I was to find that my positive experience with Lama Wuufang was just the tip of the iceberg. He had been treating other folks I know and I soon found out he was successful with them as well, including the rinpoche I have been working with for thirty years. Recently my dharma teacher Khenpo Rinpoche had been pretty much unable to walk easily. He had been to about every kind of allopathic doctor (and natural healers) and his students had showered on him drawers full of various herbs and medicines, literally boxes full. None of them had worked and it seemed that Rinpoche might never walk again. Lama Wuufang asked to treat Rinpoche and because Wuufang was one of his lamas (and a senior student), Rinpoche allowed it, although he had been endlessly examined with no luck. Lama Wuufang treated Rinpoche and very shortly after Lama Wuufang began treatments Rinpoche was up and walking again. Everyone was amazed. A similar case was with one of the resident staff at KTD, a man whose health had deteriorated due to a serious illness so that he had to use a wheelchair. Lama Wuufang treated him and at the recent intensive I just returned from he was up and walking by himself again. Again, remarkable. And I witnessed Lama Wuufang's skill with my own sister-in-law just a few days ago. A registered nurse, she had been suffering from some problem in the upper throat/chest for years and doctors had been unable to even diagnose it, much less cure it. Lama Wuufang immediately diagnosed is as "plum-pit something-or-other" and cured it within a few minutes just by manipulating her ear. The problem was gone. And lastly, while madly photographing during this recent teaching intensive I pushed myself too hard, being on my feet for many hours and gradually getting farther and farther out of my body, so to speak. In the middle of this Lama Wuufang walked up to me and said that he could see by looking at me that I was now holding too much heat in my body, which is not good for me. He then gave me special Chinese medicine to take for just a few days, and when I did I felt much better within an hour or so. Folks, I am not a believer in anything but practical stuff and I am not sure what to think of all of this, but why bother, if it works. That is good enough for me. I use allopathic medicine for diagnosis, but I don't even have a personal doctor. IMO, too many doctors have a terrible bedside manner, to put it gently. In Lama Wuufang I find a doctor who is highly trained spiritually and is also kind and capable medically. Most of all he is effective. His methods work. And I did not mention that he won't take any payment? 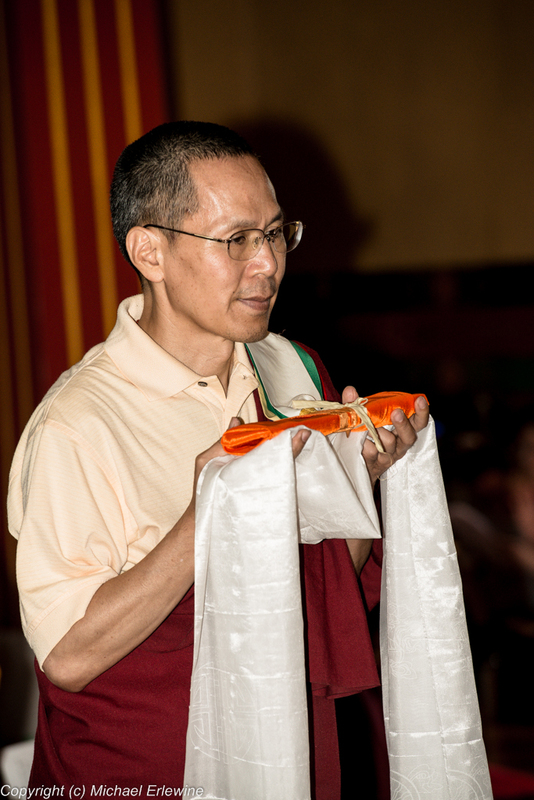 He suggests that we donate to KTD Monastery (or directly to Rinpoche) if we wish. So I deeply am appreciative of the existence of someone like Lama Wuufang and I hope he will not mind that I give out his web address should any of you want to know more about him. Here it is. I will try to continue some of my recent experience on retreat tomorrow.